Last Sunday night I served on a cyber-safety panel at HUB Church that meets at Quail Glenn Elementary School in Roseville. My topic was “Keeping Tabs on Your Child’s Social Media,” which inspired me to write this feature below. Parents and tech-savvy youth are experiencing a power crisis that will not be resolved by fiat. The power crisis can only be resolved by opening our hearts and minds to the nature of our humanity as self-determining, spiritual beings having a human experience. 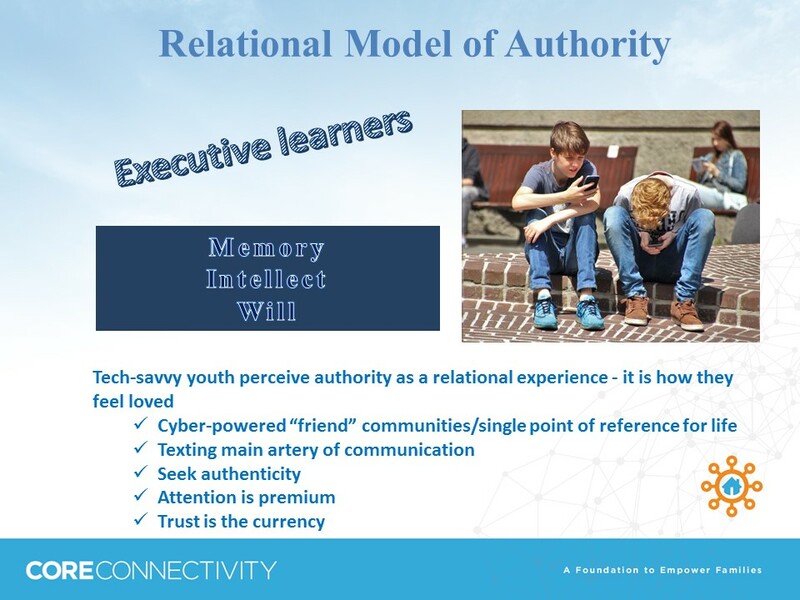 The paradigm for parental authority must shift away from authoritarian or authoritative roles to a relational authority role as explained below. Then house rules to regulate the use of technology may become an integral part of your child’s sense of empowerment as a whole person. Whenever the topic of social media and cyber safety come up there is a presumption that somehow parents are remiss. That parents just need to have a better handle on making rules about technology use and enforcing them. In some ways, it seems like we as a society have lost confidence in parents’ ability to raise kids because the popular culture and the internet have taken over as the most powerful influence. As a mom of two grown sons trained in behavioral science, I left a career in technology circa 2004 to better understand how cyber connectivity impacts the parent-child bond and the new demands on parents. That is when my youngest son hit middle school and devices landed in the hands of youth. Today I can tell you with confidence that never before has a generation of parents had so little perceived control over the security of their children. And at the same time, there has never been a generation more blessed with opportunities to deepen their trust bond with children. Youth today get a lot of fear and fakery in their social networks and they are seeking authenticity which translates as fearless –meaning, we must give up the desire to be in control of the child and the technology. A parent’s influence is based upon on controlling their own emotion and creating a family culture of trust and transparency so as to impart wisdom (i.e., family creed, values, and house rules). This is the authenticity that children seek to feel secure and will be more likely to receive and act upon guidance from home. And still it is easy to fall into a trap of believing that our power is in the title “parent” and the house rules. The children are digital natives and can easily access social media platforms without the parents’ knowledge. A recent Common Sense Media poll indicated that 54% of teens said that if their parents really knew all about their online experiences they would be even more worried; and 46% of teens said they thought their parents worried too much about social media. Because the technology makes it easy to keep risky secrets, parents cannot know where their children go online and the things they experience unless their children choose to tell them. Therein lies a power crisis for tech-savvy youth and parents. Recognizing the power limits of parents is all about empowering youth by engaging them as emerging executives. This means that parents recognize that their child at any age is in charge of him or herself. Children actually have the same faculties of the soul as adults: memory, intellect and will. At early ages they are making decisions about their own worldview and choosing to obey, comply or rebel. They are also exposed to devices which are very compelling (in that devices are designed to tap the same reward centers in the brain as a drug) and can easily convince them that their power resides in the experience of using the device and may perceive attempts to control the use as a hostile act or a threat to their perceived sense of well-being. The bullies, pedophiles and commercial interests capitalize on this truth in order to engage youth and exploit them. The pre-internet parenting paradigm asserted that parents have control over their children illustrated by this statement: “My child would never_____.” In response to the advent of the internet and mobile connectivity, the parenting paradigm must shift to recognize that the child has free agency and the role of the parent is to a) recognize their child has this power of self-determination, and b) show them how to use their power wisely. Parents are in charge of the home environment and creating a family culture that promotes trust and transparency so as to teach children how to use technology wisely. The child is in charge of testing limits and learning how to find their identity and value as a trustworthy citizen in the family and then in the community. In order to help their children be trustworthy users of social media, parents do have power in how they choose to shape their family culture. 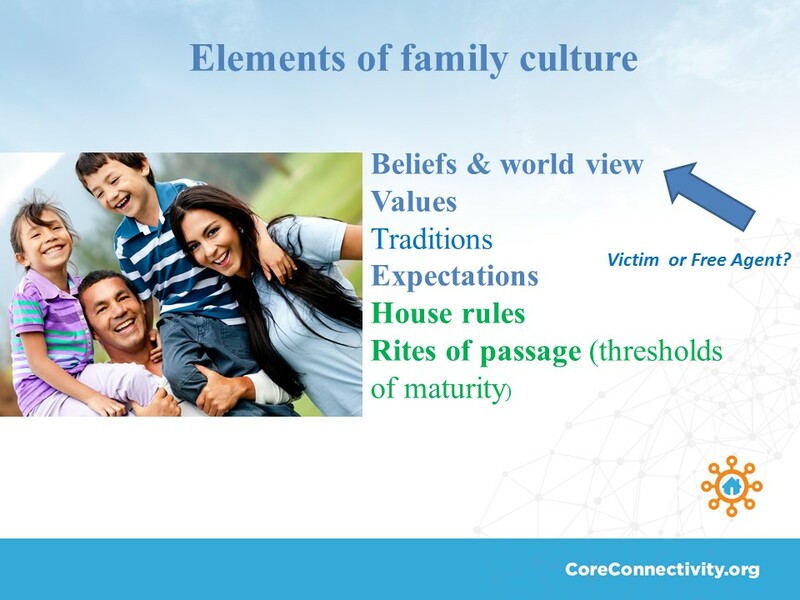 The foundation of your family culture is your worldview. When you are challenged or encounter adversity do you perceive yourself as a free agent or a victim? What you choose to believe about your power is your worldview. In this regard, everybody refers to God, including atheists. And it is a historical fact that a free society was founded by a handful of people who acted on one mustard seed of faith: that one God over all of humanity grants every individual intelligent life and free will, and this is power over your own thoughts and actions that can never be taken, but is easily surrendered. In this paradigm of power, an atheist has the right to stand in the public square and declare there is no God. My faith informs me that this belief about power recognizes and honors free will as God does with humanity. I therefore know that I cannot make my children share my beliefs, but I can educate them to think for themselves in all circumstances. In order to accomplish this there must be freedom to choose what to believe and how to respond to life experiences. So when you have conversations about regulating the use of technology, and you frame it in the context of this statement: “You already have power. My job is to show you how not to be duped into giving it up to the bully, the drug or the device,” the greater the chances your child will choose to engage with you to formulate strategies and boundaries for social media use as empowerment. The aim is to inspire open communication about social media use so there will be less reason to hide it from you. Parent power is indeed maximized as we release our desire to be in control of the things that are not our domain. When we recognize that our children are actually emerging executives with their own life experiences informing them radically differently than those of our own, and we are open to listening to their experiences, interests, desires and fears, we are then in a better position to train them how to think for themselves. Then they will want to follow the house rules for use of technology that you create together. Tips to create house rules for technology.